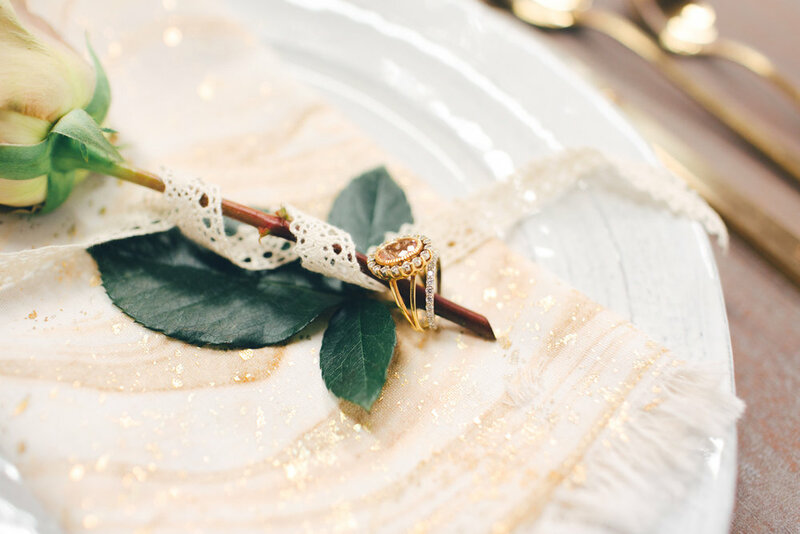 This stunning wedding inspiration was conjured up by the talented, LA-based photographer Stephanie Fishbein. Her artistic stamp is evident in every photo. The first words that come to mind are industrial, romance, and of course...purple. Our real-life couple shared the story of their wedding day through each vignette. Not only were the bride and groom, Kristin and Reiley, beautiful on the outside, but more importantly their inner beauty radiated the space. These two were meant for each other and their sweetness could not be ignored. They were affectionate, loving, light-hearted, and everyone was smitten with them. They spoke only kind things to everyone working on the shoot, and we loved hearing them talk about living a more relaxed life outside the city and raising chickens: down-to-earth and gracious. The first narrative centered on our drop-leaf table used for both a sweetheart table and cake table. However, before we venture into the foray of its versatility, we were gushing over Art Share LA's industrial metal sliding door that set the tone and served as the backdrop: an Anthropologie dream come true. Its flecked, scratched, patina, and heavy use reveal its strength, permanence, and presence. It paired nicely with our 1960's vintage pedestal drop-leaf table painted in graphite with a grey wash on top. Our love birds perched on the matching ornate carved chairs whilst savoring champagne. 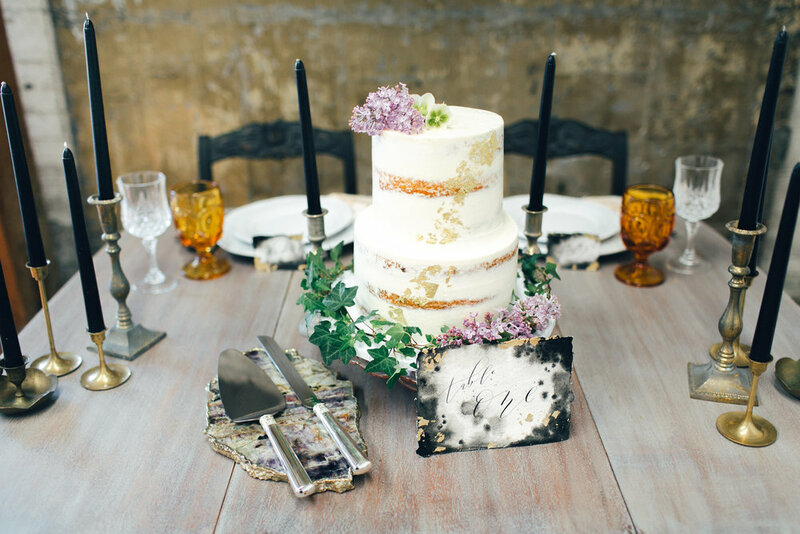 Our classic table first displayed the gorgeous two-tiered naked cake with gold leafing by Sweet E's Bakeshop which rested atop our pink cut glass cake stand circa 1960's. 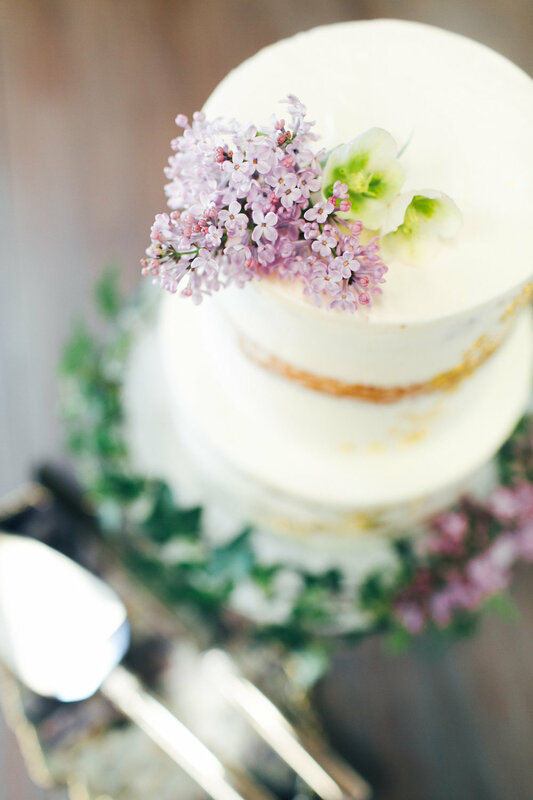 The cake was elegant, sophisticated, and ambrosial. Venice Wildflower designed delicate florals in a cohesive color palette: purple, tan, white, and light pink. As a former east coaster I am partial to lilacs: reminiscent of springtime as a child. I was giddy they accented the cake. For the sweetheart table it was styled with our gold flatware, amber goblets, brass candlestick holders, a loving cup, clear cut crystal goblets, and our popular patinaed brass lantern that cradled candles and flowers which accented the vignette. 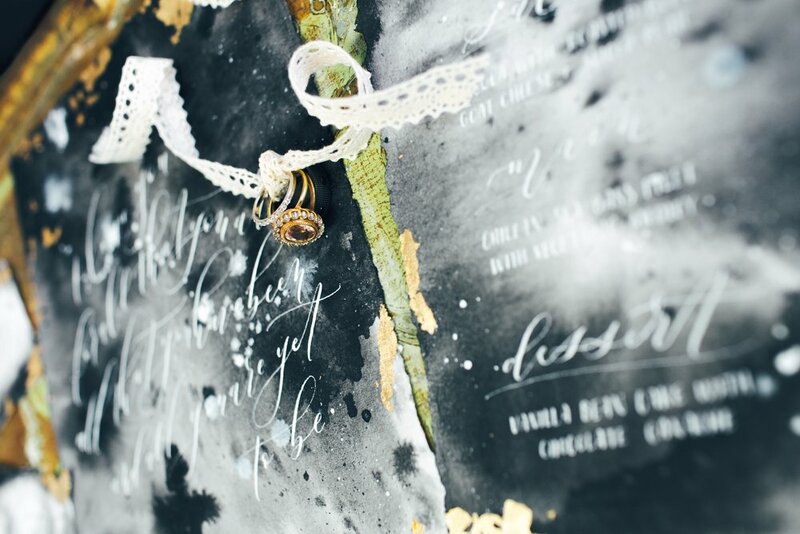 The showstopping invitation suite and calligraphy by Cristina Leis were even more impressive in person. 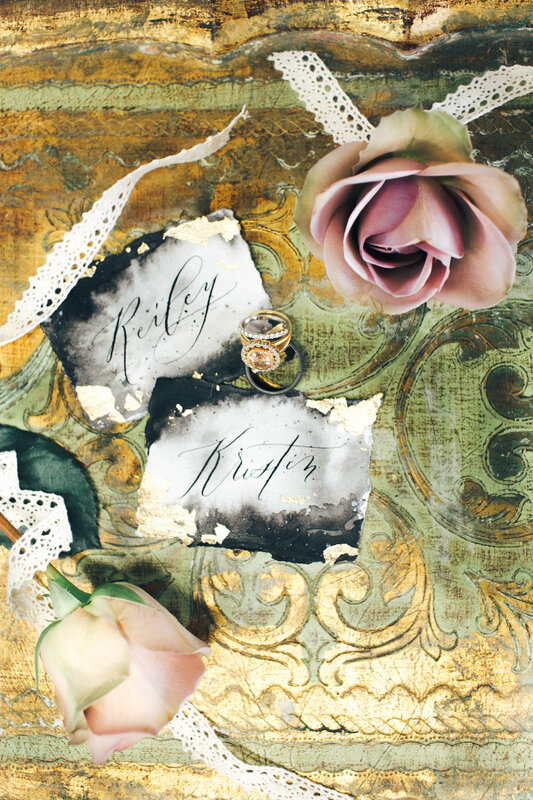 The delicate, yet dramatic, paper and dark watercolor with gold leafing stationery adorned our extremely popular gold nesting table, along with roses, lace trim, and the restrained and beautiful jewelry by Suneera. Many of her pieces were fashioned from the current trending metal: rose gold. A metallic that worked so well with the models and our props. The lovely Kristin and Reiley closed the day with a stroll in Barnsdall Art Park holding hands, embracing each other, and ready to take on the world. Gorgeous LA weather, lush scenery, and beautiful lighting created ambiance for perfect photographs and memories.